Mesenchymal stem cells (MSC) have generated a great amount of enthusiasm over the past decade as a novel therapeutic paradigm for a variety of diseases. Currently, MSC based clinical trials have been conducted for at least 12 kinds of pathological conditions, with many completed trials demonstrating the safety and efficacy. This review provides an overview of the recent clinical findings related to MSC therapeutic effects. Roles of MSCs in clinical trials conducted to treat graft-versus-host-disease (GVHD) and cardiovascular diseases are highlighted. Clinical application of MSC are mainly attributed to their important four biological properties- the ability to home to sites of inflammation following tissue injury when injected intravenously; to differentiate into various cell types; to secrete multiple bioactive molecules capable of stimulating recovery of injured cells and inhibiting inflammation and to perform immunomodulatory functions. Here, we will discuss these four properties. Moreover, the issues surrounding clinical grade MSCs and principles for MSC therapeutic approaches are also addressed on the transition of MSCs therapy from bench side to bedside. Stem cells have the capacity to self-renew and to give rise to cells of various lineages. Thus, they represent an important paradigm of cell-based therapy for a variety of diseases. Broadly speaking, there are two main types of stem cells, embryonic and non-embryonic. Embryonic stem cells (ESCs) are derived from the inner cell mass of the blastocyst and can differentiate into cells of all three germ layers. However teratoma formation and ethical controversy hamper their research and clinical application. On the other hand, non-embryonic stem cells, mostly adult stem cells, are already somewhat specialized and have limited differentiation potential. They can be isolated from various tissues and are currently the most commonly used seed cells in regenerative medicine. Recently, another type of non-embryonic stem cells, known as induced pluripotent stem cell (iPSC) has emerged as a major breakthrough in regenerative biology. They are generated through enforced expression of defined transcription factors, which reset the fate of somatic cells to an embryonic stem-cell-like state. MSCs must have the capacity to differentiate into osteoblasts, adipocytes, and chondroblasts under in vitro conditions. This review will provide an overview of the recent clinical findings related to MSCs. Roles of MSCs in clinical trials conducted to treat GVHD and cardiovascular diseases are highlighted. The therapeutic effects of MSC are mainly attributed to their four important biological properties. Here, we will discuss these four properties and the issues surrounding use of MSCs that need to be addressed during the transition of MSCs therapy from bench side to bedside. While accumulating data have shown the therapeutic effects of MSCs in animal models of various diseases, we only focus on the clinical application of MSCs in this review. The first clinical trial using culture-expanded MSCs was carried out in 1995 and 15 patients became the recipients of the autologous cells . Since then, a number of clinical trials have been conducted to test the feasibility and efficacy of MSCs therapy. 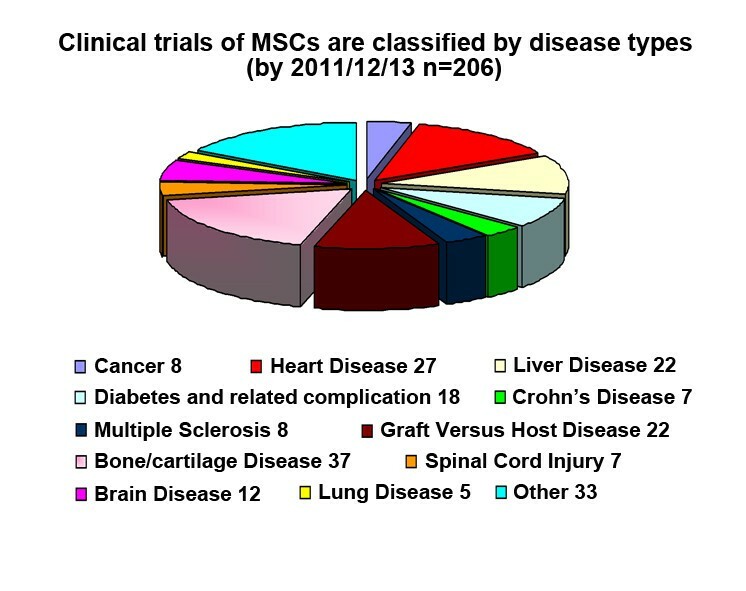 By 2011/12/12, the public clinical trials database http://clinicaltrials.gov has showed 206 clinical trials using MSCs for a very wide range of therapeutic applications Figure 1). Most of these trials are in Phase I (safety studies), Phase II (proof of concept for efficacy in human patients), or a mixture of PhaseI/II studies. Only a small number of these trials are in Phase III (comparing a newer treatment to the standard or best known treatment) or Phase II /III (Figure 2). In general, MSCs appear to be well-tolerated, with most trials reporting lack of adverse effects in the medium term, although a few showed mild and transient peri-injection effects . In addition, many completed clinical trials have demonstrated the efficacy of MSC infusion for diseases including acute myocardial ischemia (AMI), stroke, liver cirrhosis, amyotrophic lateral sclerosis (ALS) and GVHD. Clinical trials of MSCs are classified by disease types. 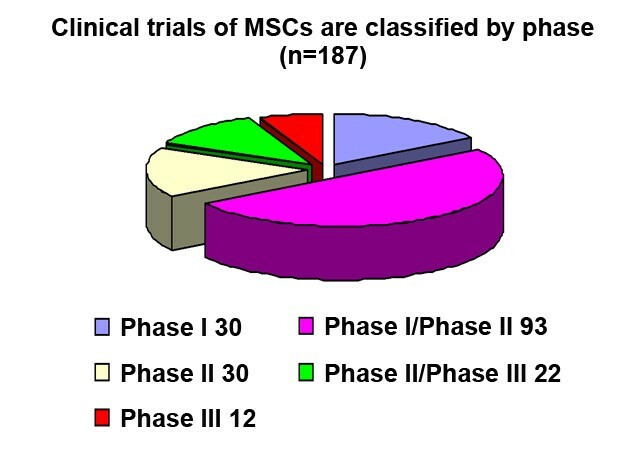 Clinical trials of MSCs are classified by phase. Acute graft-versus-host disease (aGVHD) occurs after allogeneic hematopoietic stem cell transplant and is associated with high morbidity and mortality [6–8]. Currently, corticosteroids are the gold standard for initial treatment of aGVHD. However, they are only effective for some patients. Over the past decade, the immunomodulatory functions of MSCs have triggered great interests in their application for GVHD. Le Blanc K et al were the first to transplant haploidentical MSCs in a 9 year old boy with severe treatment-resistant grade IV aGVHD of the gut and liver. They found the clinical response was striking and the patient was well after 1 year . A subsequent study was reported by Ringdén O et al in 2006. They gave MSC to eight patients with steroid-refractory grades III-IV GVHD and one who had extensive chronic GVHD. Acute GVHD disappeared completely in six of eight patients. Complete resolution was seen in gut (6), liver (1) and skin (1). Their survival rate was significantly better than that of 16 control patients. Five patients are still alive between 2 months and 3 years after the transplantation . The beneficial effect of MSCs infusion was then observed in a series of studies (Table 1) . Acute GVHD disappeared completely in five of six patients, four of whom are alive after a median follow-up of 40 months (range, 18–90 months) after the initiation of AMSC therapy. All four surviving patients are in good clinical condition and in remission of their hematological malignancy. HLA-identical sibling donors (n = 5), haploidentical donors (n = 18), third-party HLA-mismatched donors (n = 69). One out of three patients showed slight improvement of chronic GVHD. Two patients with severe acute GVHD did not progress to cGVHD. One patient received MSC to stabilize graft function after secondary haploidentical transplantation. One patient recovered from trilineage failure due to severe hemophagocytosis. A median dosage of 0.9 x 10(6)/kg (range 0.6-1.1). Two patients (15%) responded and did not require any further escalation of immunosuppressive therapy. Eleven patients received additional salvage immunosuppressive therapy concomitant to further MSC transfusions, and after 28 days, five of them (45%) showed a response. Four patients (31%) are alive after a median follow-up of 257 days, including one patient who initially responded to MSC treatment. Ninety-four percent of patients had an initial response (77% complete response and 16% partial response). No infusional toxicities or ectopic tissue formations were reported. Median dose was 1.2 x 10(6)/kg (range: 0.7-3.7 x 10(6)/kg). Overall response was 71.4%, with complete response in 23.8% of cases. None patients presented GVHD progression upon MSC administration, but 4 patients presented GVHD recurrence 2 to 5 months after infusion. Two patients developed chronic limited GVHD. 7 (58%) patients had complete response, 2 (17%) partial response, and 3 (25%) mixed response. Complete resolution of GI symptoms occurred in 9 (75%) patients. The cumulative incidence of survival at 100 days from the initiation of therapy was 58%. All these studies with varying numbers of patients and different degrees of GVHD severity suggest that complete and partial responses can be achieved in a majority of patients after MSCs infusion and that MSCs might represent a potential novel therapy for GVHD. Despite progression of treatment options, ischemic heart disease and congestive heart failure remain major causes of morbidity and mortality. Cellular therapy for cardiovascular disease heralds an exciting frontier of research. Among the used cell types, MSCs are an attractive candidate for cardiovascular repair due to their abovementioned biological properties. In preclinical studies using experimental animal models of cardiac injury, MSCs had been show to engraft after systemic or local administration and improve the repair of infarcted myocardium [19–21]. In a rat model of dilated cardiomyopathy, Nagaya N et al found that MSC transplantation significantly increased capillary density and decreased the collagen volume fraction in the myocardium, resulting in decreased left ventricular end-diastolic pressureand increased left ventricular maximum . Clinical trials using MSCs to improve cardiac function have also demonstrated encouraging results. For instance, in a pilot study, sixty-nine patients who underwent primary percutaneous coronary intervention within 12 hours after onset of acute myocardial infarction were randomized to receive intracoronary injection of autologous bone marrow mesenchymal stem cell or standard saline. Several imagining techniques demonstrated that MSCs significantly improved left ventricular function . We conducted a clinical trial which recruited sixty-nine patients with acute myocardial infarction after percutaneous coronary intervention (PCI). They were randomly divided into intracoronary injection of MSCs (n = 34) and saline (n = 35) groups. Three months after MSC transplantation, left ventricular ejection fraction (LVEF) in MSCs group increased significantly compared with that of pre-implantation and that of the control group . Here we summarized the currently completed clinical trials registered with clinicaltrials.gov that using MSC to treat cardiovascular diseases (Table 2). While a number of studies demonstrated the therapeutic effects of MSC transplantation, the underlying mechanisms remain unclear. The beneficial effects of MSCs might be mediated not only by their differentiation into cardiomyocytes but also by their ability to secret large amounts of bioactive molecules. In regard to liver diseases, MSCs have been used to treat cirrhosis in a limited number of patients. In a phase I trial, four patients with decompensated liver cirrhosis were included. They received autologous MSC infusion through a peripheral vein. There were no side-effects in the patients during follow-up. The quality of life of all four patients improved by the end of follow-up . In another phase I-II clinical trial, 8 patients (four hepatitis B, one hepatitis C, one alcoholic, and two cryptogenic) with end-stage liver disease were included. After autologous MSCs injection, all patients tolerated well and their liver function improved, suggesting the feasibility, safety, and efficacy of using MSCs as a treatment for end-stage liver disease . To test the safety and efficacy of allogenic MSCs for Patients with refractory primary biliary cirrhosis (PBC), we are conducting an open-label, multiple centers, randomized, Phase I-II clinical trial (ClinicalTrials.gov ID NCT01440309). The use of MSCs in clinical applications requires understanding of their biological characteristics that contribute to the therapeutic effects. Currently, the following four properties are considered the most important (Figure 3): (1) the ability to home to sites of inflammation following tissue injury when injected intravenously (2) the ability to differentiate into various cell types (3) the ability to secrete multiple bioactive molecules capable of stimulating recovery of injured cells and inhibiting inflammation (4) the lack of immunogenicity and the ability to perform immunomodulatory functions. 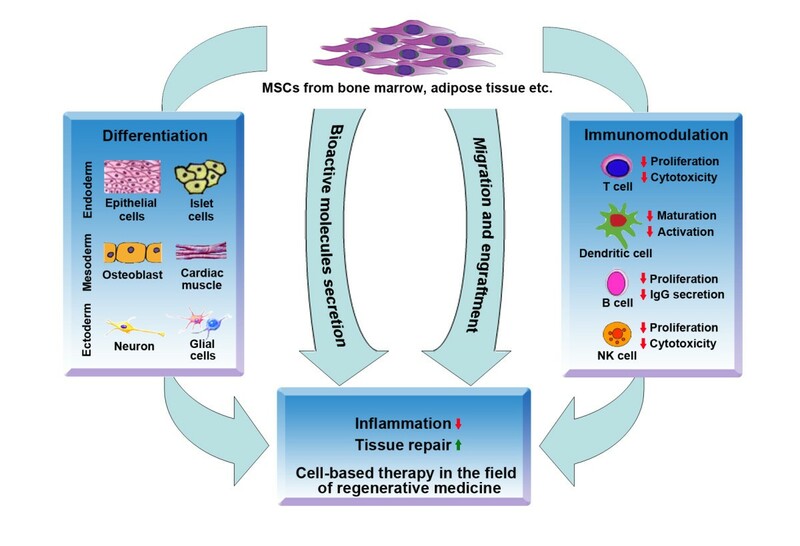 Although we divide the effects of MSCs into these four aspects for better description in this review, in fact, these four aspects are combined and overlapped. Their exact roles in the therapeutic effects of MSCs remain to be further elucidated. A schematic model demonstrating the biological properties of MSCs that are associated with their therapeutic effects. MSCs have the capacity to migrate to, and engraft in, sites of inflammation after systematic administration and exert local, functional effects in the resident tissue. Various studies have demonstrated that under a variety of pathologic conditions, MSC selectively home to sites of injury, irrespective of the tissue. Ortiz LA et al showed that murine MSCs could home to lung in response to injury, adopt an epithelium-like phenotype, and reduce inflammation in lung tissue of mice challenged with bleomycin . We found that transplanted MSCs could migrate to injured muscle tissues in mdx mice . Cell migration is dependent on a multitude of signals ranging from growth factors to chemokines secreted by injured cells and/or respondent immune cells . Migration of MSCs may also be regulated by such signals. Studies have demonstrated that MSCs migration is under the control of a large range of receptor tyrosine kinase growth factors such as platelet-derived growth factor (PDGF) or insulin-like growth factor 1 (IGF-1) and chemokines such as CCR2, CCR3, CCR4 or CCL5 as assessed by in vitro migration assays . MSCs have the capacity to differentiate into mesenchymal lineages including osteoblasts, adipocytes, and chondroblasts under both in vitro and in vivo conditions . Studies have also reported that MSCs can give rise to cells of other lineages. We found that MSC injected immediately into C57BL/6 mice after irradiation-caused injury could differentiate into functional lung cells, such as epithelial and endothelial cells . Other studies employing animal model of lung injury caused by bleomycin exposure showed that MSCs engrafted in lung differentiated into type I pneumocytes  and type II epithelial cells  or assumed phenotypic characteristics of all major cell types in lung including fibroblasts, epithelial cells, and myofibroblasts . In addition, MSCs could be induced to differentiate into cells of ectoderm. For example, Kopen GC et al were the first to demonstrate that MSCs injected into the central nervous systems of newborn mice could adopt morphological and phenotypic characteristics of astrocytes and neurons . Subsequent studies confirmed such findings [35, 36]. The evidence that MSCs were able to differentiate into specialized cells of tissues such as epithelial cells or nervous cells, opened up the possibility of using MSCs to substitute damaged cells for disease treatment. We showed that in a C57BL/6 mouse model of ischemia-reperfusion (I/R) kidney, transplanted MSCs were able to differentiate toward renal tubular epithelium at an early stage of injury. The differentiated donor cells replaced the vacant space left over by the dead cells, therefore contributing to the maintenance of structural integrity and preceded to a subsequent tissue repair process . Several studies also demonstrated the contribution of MSCs differentiation to disease treatment . However, accumulating data suggest the replacement of the damaged cells by MSCs through specific differentiation may be only a small part of the mechanism underlying MSCs’ therapeutic effects. MSCs could secrete multiple bioactive molecules including many known growth factors, cytokines and chemokines which have profound effects on local cellular dynamics (Table 3). Administration of conditioned medium of MSCs is able to recapitulate the beneficial effects of MSCs for tissue repair. For instance, data from Van Poll D et al provide the first clear evidence that MSCs conditioned medium (MSC-CM) provides trophic support to the injured liver by inhibiting hepatocellular death and stimulating regeneration, potentially creating new avenues for the treatment of fulminant hepatic failure (FHF) . Takahashi M et al demonstrated that various cytokines were produced by BM-MSCs, and these cytokines contributed to functional improvement of the infarcted heart by directly preserving the contractile capacity of the myocardium, inhibiting apoptosis of cardiomyocytes, and inducing therapeutic angiogenesis of the infarcted heart . A protein-array analysis of MSC-CM detected 69 of 174 assayed proteins and most of these detected molecules are growth factors, cytokines, and chemokines. They have known anti-apoptotic and regeneration-stimulating effects . These effects can be either direct or indirect or both: direct by causing intracellular signaling or indirect by causing another cell in the microenvironment to secrete functionally active agent. The ability of MSCs to modulate the immune system was first recognized in 2000 when Liechty KW et al found that MSCs have unique immunologic characteristics that allow their persistence in a xenogeneic environment . Since then, an emerging body of data confirmed the immunomodulatory properties of MSCs. However, the precise mechanisms underlying their immunomodulation are still not fully understood. Direct cell-to-cell contact and/or release of soluble immunosuppressive factors may play major roles. MSCs could interact with a wide range of immune cells, including T lymphocytes, B lymphocytes, natural killer cells and dendritic cells. A brief summary of the in vitro interaction of MSCs and immune cells was shown in Table 4. The immunomodulatory effects of MSCs have also been examined in a variety of animal models of immune diseases. For instance, donor-derived MSC could induce long-term allograft acceptance in a rat heart transplantation model  . The immunomodulatory functions of MSCs have generated a great amount of interest in their potential for treatment of immune disorders such as GVHD. Over the past decade, there have been a large number of publications on MSCs, reporting their biological properties, experimental and clinical applications or underlying molecular mechanisms. Although tremendous advancements have been made from both preclinical and clinical studies using MSCs, substantial challenges are still to be overcome before MSC therapy can fulfill its promise in wider clinical practice. (1) Safety issue: up to now, few adverse effects have been reported after MSC administration, in terms of immediate, infusional toxicity and of late effects. However, the relatively small number of patients being treated with MSCs does not allow the drawing of definitive conclusions on the safety of MSCs. Furthermore, MSCs has been reported to promote tumor growth  and metastases . Potential for malignant transformation of cultured MSC commonly used in clinical cell-therapy protocols has also been reviewed . In addition, under some pathological conditions, application of MSCs might do more harm than good. We found that MSCs could aggravate arthritis in collagen-induced arthritis model by at least up-regulating secretion of IL-6, which favors Th17 differentiation . These studies remind us that particular attention should be paid to the biosafety of MSC. (2) Quality control: Cell amplification by culture is not free from the dangers of microbial contamination, thus bacteriological tests (mainly in liquid medium) should be carefully performed during the various phases of production and at harvest. In addition, viability and phenotype tests, oncogenicity tests and endotoxin assay should also be included. In addition, optimal timing of MSC administration, cell dose and schedule of administration need to be defined according to disease types and severity. (3)Clinical grade production:Clinical application of MSC requires a large number of cells for transplantation, so in vitro expansion of MSC is inevitable. Studies have suggested that continuous passaging of MSCs could lead to cell transformation. Rubio D et al found that human mesenchymal stem cells could undergo spontaneous transformation following long-term in vitro culture (4–5 months).The transformed cells exhibited chromosomal abnormalities, increased c-myc levels and telomerase activity, and formed tumours on transplantation . To reduce malignant transformation of human MSCs, meticulous attention must be taken to prevent cell senescence and limit the number of passaging. According to Bernardo ME et al , MSCs can be safely expanded in vitro until passage 25. We conducted the first stem cell clinical trial approved from SFDA in China and our standard procedure requires that the optimal passage should be less than passages 6 during the manufacture of MSC. MSCs used in clinical trials must be manufactured under the conditions required by Good Manufacturing Practice (GMP). (4) Autologous vs allogeneic MSCs: MSC are immune privileged because they express low levels of major histocompatibility complex-I (MHC-I) molecules and do not express MHCII molecules or costimulatory molecules such as CD80, CD86 or CD40 . This unique property allows for the transplantation of allogeneic MSCs without inducing immune rejection. Thus both autologous and allogeneic MSCs can be used in the clinical setting. However, which one to prefer needs further investigation. (5) Clinical transition: In the field of MSCs research, biologists and clinicians should come together to establish proper and stringent regulations and standards for MSC based therapies. The regulations and standards should at least include methods and criteria for the culture, storage, shipping, and administration of MSCs. MSC therapies are undergoing rapid development and have generated great excitement amongst scientists and physicians. Currently, more randomized, controlled, multi-centre clinical trials are needed to find the optimal conditions for MSC therapy. We believe that eventually a novel and safe therapy with MSCs can emerge and revolutionize treatment and therapies for patients with severe diseases. This work was supported by grants from the “863 Projects” of Ministry of Science and Technology of PR China (No. 2011AA020100); National Natural Science Foundation of China(Grant No. 30830052); The National Key Scientific Program of China(No. 2011CB964901)and Program for Cheung Kong Scholars and Innovative Research Team in University-PCSIRT(No. IRT0909). SW drafted the manuscript; XQ formatted the figures and tables, participated in manuscript revision; RCZ designed and drafted the manuscript, gave financial and administrative support. All authors read and approved the final manuscript.